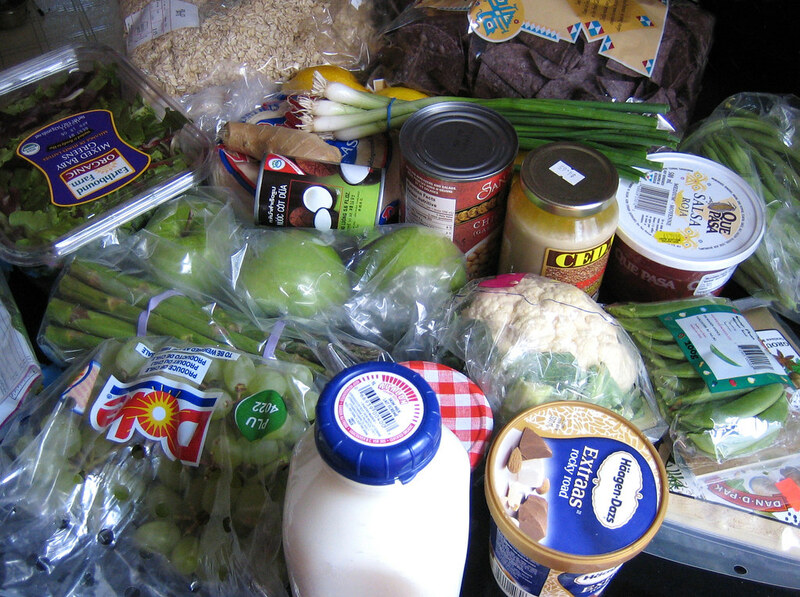 what does your grocery haul look like? I just came back from a lovely bike ride to an adjoining neighbourhood for groceries. It was warm, sunny and all the blossoms and flowers were in bloom. When I got home and unloaded my 2 rear panniers onto our kitchen table and was amazed at all the good things I managed to pack onto my bicycle. I just had to take a photo of this bountiful cornucopia! Seeing all this stuff piled onto our table made me wonder about how other people shop for groceries. We usually pick up a few things on a daily basis from our local corner grocer and then head out on our bikes once a week to another ‘hood to pick up a larger load of groceries where there is better selection at a better price. Want to share your grocery photos & lists? I’ll bet I’m not the only one who’s curious! I end up shopping almost every day some weeks, and that’s how I like it. I always have some food in the house, but I like to pick up produce and other odds as they strike my fancy. Fortunately I’m almost always by a co-op grocery AND I have the greatest corner grocery store in my neighborhood–a dying breed, I tell you. Yep, lists are a good idea! Oh, I bet you’re not the only one who’s curious….. I’d read just about anything in list form – but grocery lists are my favorite. Such a great idea for a post & I love that you call it a ‘knob’ of ginger – so cute! Maven! Thanks for stopping by!! I too only shop at my neighbourhood grocerers…but the neighbourhood next to our has even better grocers…10+ great shops as opposed to 2 in my ‘hood. Thanks for your list too. Thanks for commenting Michele! I love to see how everyone shops. And I wouldn’t feel guilty for treats…they make the world just a bit better! Thanks Heather for your sweet comments! Having so many food allergies must really be restrictive. I’m glad your finding some inspiration here! Dawna, it is fun peeping into other people’s baskets! As for the coconut milk, I have no real plans. I just bought it because it was a half-size can & that made it cute in my book! As an inveterate shopping-basket-peeker (peeper?) I love seeing such lists! I tend to do one larger shopping trip on the weekends, and then stop at the little markets on my way home from work most days to pick up a lone item that I didn’t realize I’d need, or hadn’t quite run dry. I’m IN! I’m shopping for groceries tomorrow and will post on my blog! Looks like quite the haul – can’t wait to see what you do with it. Don’t you just love grocery shopping! I love it … it’s one of the highlights of my week. And I especially love knowing what other people buy. Your list looks both nutritious and delicious, which I think is the ideal when it comes to grocery shopping. I sometimes find myself looking at the carts of other people and wondering what they do with all those boxed, refined foods??? I’m also amazed you got all of that onto your bike! You go girl! Purplecupcake, great! I can’t wait to see your list. Thanks, Cate. I have no real clues what I plan on doing with it all! Ivonne, I love grocery shopping too. I’m always amazed when I shop at those big supermarkets just what people are buying! It can give me the shivers! What a lovely lifestyle, I’d love to be able to ride a bicycle to go do my grocery shopping.